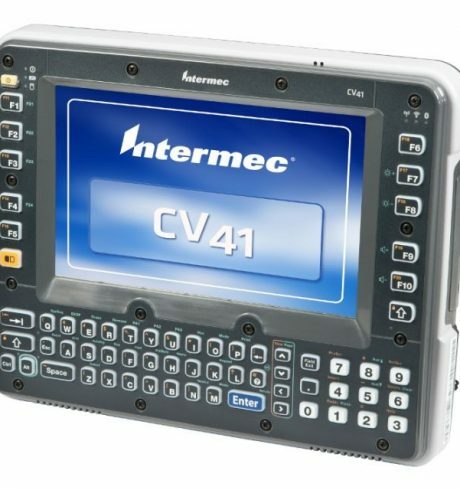 High user-friendliness, reliable performance and a robust design – that is what the CV41 vehicle computer from Honeywell offers you. It features an 8″ touch display (20 cm), as well as a fully fledged keyboard and numerous programmable function keys. The front-panel may be easily and quickly exchanged on-site in case of a defect or when it is worn out. This saves users valuable time plus reduces downtimes to a minimum. You may also easily relocate the entire CV41 from vehicle to vehicle, even during operation and without data loss, thanks to the integrated USV battery. With its integrated dock you either dock or remove the computer with just one hand. The ignition sensor starts up the CV41 immediately, so that you may start right away. Users are supported daily by an Intel Atom Z530 processor with 1.6 GHz, 1 GB SDRAM and 1 GB Flash memory, as well as the standard 802.11 a/b/g Wi-Fi. Additionally available as options are: WWAN, GPS, a super bright outdoor display, and even a defroster for cold storage.